To the concerned and thinking Filipino, a serious study of our socio-economic and political history, then and now, can only lead him to the realization that fundamental socio-economic and political changes by peaceful means, i.e. reform, can not and will not happen. His study of the historical past and the presently continuing/worsening national predicament will bring him to the same conclusion, whether he uses common sense, reads either Marx & Engels' "Communist Manifesto" or C. Wright Mills' "Power Elite" in his analysis. Suffice it to say that the failure to solve our people's poverty is not strictly the fault of America nor of foreign institutions (though America has the strongest control and influence in them), and it is also not completely the fault of the so-called leaders of our homeland. It takes two to tango, to screw for so long and continually the country and our fellow countrymen. Prior to the Marcos Dictatorship, our private and public debts were mainly through the large banks, but the latter and their corresponding governments learned that the risks of nonpayment is minimized, if not eliminated, by using the IMF/WB to make the arrangements and have the governments of the borrowers guarantee their loans. A bright idea indeed. Governments are expected not to default and so their citizens are the ones to suffer the obligations for the oftentimes odious debts incurred, as in the case of our homeland. How can we stop the demise of our Filipino cultural heritage, of our nascent nationhood that was derailed by the 50-year American occupation and continuing miseducation? How can we stop the plunder of our economy and patrimony by America and Japan, by the local American and Chinese business elite and their native partners; and the collaboration by most politicians and bureaucrats, aided with the rationalization by the western-influenced native technocrats and defended by the US-trained military? How can we regain the loss in our civility and decency of character, which has contributed to almost an endemic corruption ? And so, how can true and fundamental changes to improve the lot of the great majority occur when the existing economic and political systems/institutions are controlled by the same power elite that does not sincerely care nor work for the betterment of the multitude? How can essential changes be obtained by going through such controlled systems and a professed christianity that is really unchristian, if not absent? All these have been tried in the past: agrarian reform, government support for native industrialization, foreign exchange control, etc. All these have been either watered down, lobbied successfully against, or mocked and destroyed by the same powers-that-be. 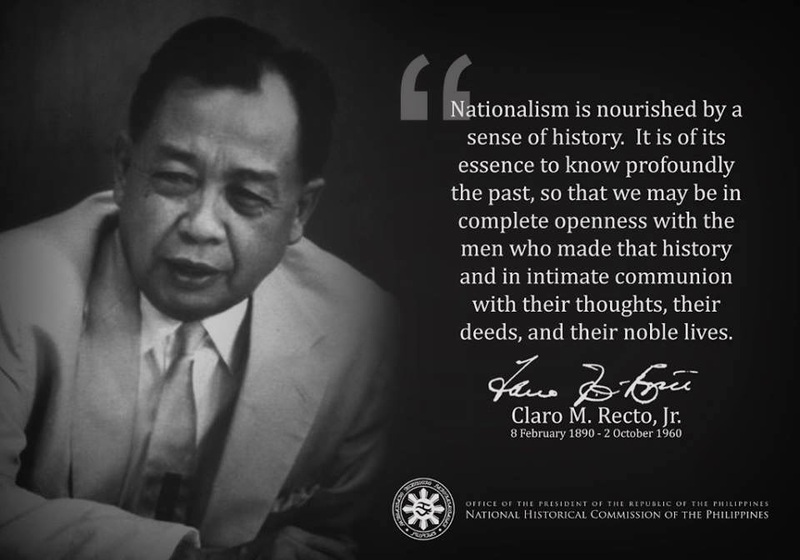 Note that the 1960s' rebirth of Filipino nationalism came and grew quickly in less than a decade given the wave of Third World nationalism, New Left political ferment in the advanced nations, but most important, the efforts of a few, dedicated nationalist intellectuals and facilitated/aided by many student idealists during the premartial law years; but was waylaid by the Marcos Dictatorship, this latter's viability made possible thanks to: US-support for Marcos, the miseducated middle class and the selfish, material interests of the Church with the status quo. Although many of those who worked for its rebirth were either assassinated or have disappeared, or even gone back to "normal" life in society; we hope and know that among the young, who are still idealistic and unencumbered with familial responsibilities, there shall always be brave and dedicated ones ready and willing to continue the work for its fruition. Because, even among us who are afraid or suspicious of any hint or talk of socioeconomic-political transformation, know that it is only through a revolution, led by truly nationalist leadership with the unified support and participation of a nationalist majority, can Filipinos-in-the-Philippines have a chance to implement the necessary transformations towards their "common good". Thomas Jefferson himself believed in the moral right of an oppressed people to make a revolution. America, now its government and policies subtly but more effectively and efficiently controlled by its transnational corporations, its citizens made content by consumerism and misinformed by its few, corporate-controlled media, has forgotten about its revolutionary heritage and instead become reactionary. Here's special tips and information about Car Dealer To Save Time.